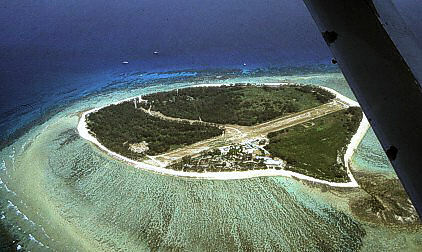 A little coral cay on the southern end of the Great Barrier Reef, so small, it needs the whole diameter to provide a runway for small airplanes of a maximum capacity of 18 people. There is the resort side of the runway, where accomodation, restaurant and shops can be found. On the other side of the runway one finds the staff accom and the glass bottom boats. The trees are possibly native and re-introduced, but nobody knows, because ages ago they mined guano and nearly removed the whole island. But the casuarina trees now add a more interesting aspect to the island and provide nesting places for the noddies.